Street Press Australia have just launched their first edition of the AMID. 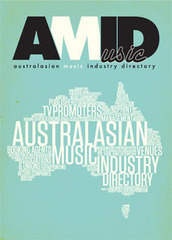 This edition of the Australasian Music Industry Directory is the first one produced by Street Press Australia. I haven’t seen the hardcopy version, or the iPhone app, but from what I’ve seen of the online version they’ve done a great job. The AMID lists everything you can imagine, from music-industry-specific accountants to venues Australasia-wide. And, whaddaya know, this blog is listed as a music blog. How nice! If you are serious about the industry, whether as a worker in some area, or as a band, spend the money and get a copy. Trust me, it’s worth it. Next article Athens 2011 and the Greek Revolution. Don’t believe the media.